For Varied Reasons, 4 Million Americans Call Some Other Country Home. By Jerry Schwartz. ASSOCIATED PRESS 10:03 a.m. April 23, 2005. More Americans than ever before have decided that America is no longer their home. They've put down roots abroad, from Cuba (an estimated 2,000 Americans, the latest figures show) to the United Kingdom (224,000). They're in Germany (210,880), in the Philippines (105,000), in Israel (184,195). If they were a U.S. state – call it Expatria – its population, some 4 million Americans, would place it right in the middle, along with Kentucky and South Carolina. What does the Bush administration have in mind for Cuba? Answers might be found in two recent stories dealing with Bush administration proposals for Cuba and how the US is administering the transition in Iraq. 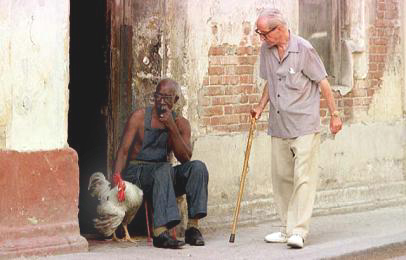 'This chicken stuck to me as I was leaving work' Cubans 'resolve' to make ends meet. HAVANA – Hiding rocks in frozen chickens may seem like a silly pastime. But for some folks, it's serious business – a way to tip government weight scales and purloin poultry for dinner. It's risky, too. Those who steal can lose their jobs or go to jail. Despite that, employee theft is widespread, anecdotal evidence suggests. "Almost everyone steals something, anything, to survive," a former cafeteria worker said. "But we don't call it stealing or robbing. Those words are too strong." HAVANA, Sep 20 (IPS) - They were poor women from the northern Spanish province of Galicia. They came alone to Cuba in the late 19th and early 20th centuries, and like so many Latin American women now emigrating to Europe, many of them ended up in poor-paying jobs as domestics or on the fringes of society as prostitutes. Under Cuba’s socialist system, the average working person earns about $10 a month – 34 cents a day, $120 a year – on which to live: to buy food and clothing and pay for rent for the entire month. Even in his black-and-white waiter's garb, Michael Lan stands out, his hair spiked, his dark brown eyes scrutinizing customers from behind rose-tinted glasses. Mr. Lan, who traces his ancestry to Guangdong Province and has been waiting tables for 11 years at Dinastia China on 72nd Street on the Upper West Side, one of the city's major Chinese-Cuban restaurants, often surprises his newest customers. This is not because he addresses them in perfect English or yells orders to the cooks in flawless Cantonese, but because he and most of Dinastia's waiters speak a Spanish as smooth as an ice-blended margarita. Their Spanish, however, tends not to have the rapidity characteristic of Cuban Spanish, and this is significant because Mr. Lan was born in Uruguay, and he has no connection to Cuba. Neither does most of the staff of 10. "See Roberto?" Mr. Lan said, pointing out a fellow waiter. "Chino-Venezuelano." Rafael? "Chino-Dominicano." Juan, the boss? "Chino-Peruano."